Join me in my kitchen in Stanmore as part of a small, intimate group: we will haul out the copper jam pans spend the morning turning luscious Black Genoa figs into delicious jam. We’ll have plenty of time for questions and will discuss selecting fruit, sterilising, setting point, pectin, and storage; share a cup of tea with scones; and you’ll go home with a couple of jars of jam. DIY Dumpling Dinners with Fish & Co. Following on from our 'sell-out' workshops over the past two years; together with Fish & Co., I am delighted to be announcing more 'DIY Dumpling’ dates for 2019. Join me Artisan Lane for this two and a half hour, 'hands on' workshop: you'll learn to make the dough and filling, before folding and cooking your own Wild Prawn and Pork Potstickers. Are you planning a trip to Italy and hoping to experience more than the average tourist? Would you like to learn Italian but don’t know where to start? Do you love Italian food? Join us for this morning adventure and learn some Italian over a delicious morning tea! This intimate class will be led by Monica from Su Misura Italy, an experienced Italian tutor and native speaker based in Melbourne, and Vanessa, The Hungry Chook, who runs popular cooking classes and workshops in Australia and Italy. Monica will teach us basic Italian conversation focusing on useful vocabulary that will help you to experience your next trip to Italy in a completely new and exciting way. Vanessa will also share her extensive knowledge of Italian cuisine and her recipe for the crostata we will enjoy together. This class is intended to be a fun and active language learning experience in a real-life context, far from any classroom, and is available for everyone - no prior knowledge of Italian is required! What's included: This two hour experience will include morning tea with home-made Crostata & Biscotti, practical language experience, printed materials with useful vocabulary for the session, .pdf material with further useful information. Following the success of our inaugural ‘Tomato Day’ at White Lodge, Woodend (VIC): Amanda Lawler and I will be hosting another next Saturday, March 14 (2020). I will also be holding a Tomato Day closer to home in the Hills District (Sydney, NSW) on Sunday, March 1 (2020). We’ll make traditional Italian passata and bottled tomatoes, as well as handmade pasta and a seasonal sauce in the wood-fire oven for lunch. * Please email me vanessa@thehungrychook.com and include your preferred location to join the wait list and receive an ‘early registration invitation’. Next March (2019), join Amanda Lawler and Vanessa Miles at two very special workshops in the bountiful Macedon Ranges. Over two days, we will be harvesting, cooking and sharing produce from Amanda’s extensive kitchen garden. To make the most of this special time of year, we’ve put together two workshops over one weekend. On Saturday Vanessa will teach you how to make delicious hand-made pasta and pillowy potato gnocchi. And on Sunday we’ll haul out the Fowlers’ and show you how to preserve your tomato glut for winter. Where possible the ingredients will be sourced from White Lodge’s kitchen garden, or some of the many small food producers nearby. Tomatoes are in abundance at the end of summer. We’ll be sharing a few of our favourite recipes so you can enjoy your home-grown tomatoes year-round. In this full-day workshop we will introduce you to the fundamental techniques and skills of home preserving, including selecting fruit, and the equipment required. We will harvest and use Amanda’s home-grown fruit (where possible) to prepare and make our own roasted tomato passata, tomato and apple relish, and bottled squished tomatoes. We’ll enjoy a light lunch in the garden (weather permitting), before finishing off the bottling so you can take your preserves home. The class includes recipes, morning tea, a light lunch and preserves to take home. The workshop will be limited to an intimate group of eight guests. A day of harvesting, cooking and eating at Amanda’s historic farmhouse in the beautiful Macedon Ranges. The day will begin with morning tea, before a stroll through the kitchen garden where we will harvest the produce we’ll cook. Then we’ll return to the kitchen to make fresh egg pappardelle, potato gnocchi and beetroot ravioli. We will discuss various flours, how to select the best potatoes, and why using seasonal ingredients is so important. The day will end outside in the garden (weather permitting) with a long table lunch that you helped prepare. The class includes recipes, morning tea and a light lunch with wine. The workshops will be limited to an intimate group of eight guests. White Lodge is situated on the outskirts of Woodend in the shadow of Mt. Macedon. It is less than an hour by car from Melbourne CBD and Trentham is twenty minutes down the road. Whilst you are there you may like to visit Kyneton, Daylesford, Trentham and the many cellar doors nearby. There are many B&B’s in the area, including The Trentham Estate and The Flop House. Due to logistics we are unable to issue refunds, however we are happy for you to send someone in your place. Please advise us of any dietary requirements at time of booking. Menu may vary due to the nature of seasonal produce. In the case of an ‘extreme fire danger warning’, the workshop/s will not proceed and a full refund will be issued. Next March (2018), join Michelle Crawford and Vanessa “The Hungry Chook” Miles at two very special Tasmanian workshops sharing, learning, cooking and eating. Middle March is the best time of year in Tasmania, the weather’s warm, harvest is at its peak, and it’s the perfect time to be outside cooking and eating. We’ve put together two workshops over one weekend to make the most of this special time of year. On Saturday it will be a seasonal long table lunch in the garden, inspired by our Italian travels. And on Sunday we’ll haul out the preserving pans for a day of bottling and jam making. Most of the ingredients will be sourced from the garden, or friends’ farms in the Huon Valley, such as beautiful free-range eggs, Bruny Island Cheese and Little Grove Olive Oil, and if not from the valley then from the Island where possible. A day of harvesting, cooking and eating at Michelle's farmhouse cottage in the beautiful Huon Valley. The day will start with coffee and cake before a stroll through the kitchen garden where we’ll harvest produce for the day such as tomatoes, potatoes, zucchini, scarlet runner beans, and fragrant basil. Then we’ll return to the kitchen to create a menu inspired by our time in Italy. We’ll make Vanessa’s amazing silky pasta, a creamy ricotta using local milk, an Italian inspired fish and vegetable dish, and to finish, peaches with amaretti roasted in the wood fire oven. We’ll be cooking both in the kitchen and outside in the wood oven ‘al forno’! The day will end outside in the garden with a long table lunch that you helped prepare. The class includes recipes, morning tea and a three course lunch with wine. Both workshops will be limited to an intimate group of eight guests. Note: This workshop has sold out - please email me if you wish to have your name included on a wait list. March is peak preserving season in Tasmania, so we’re sharing a few of our favourite recipes for preserving the late summer bounty. In this full-day workshop we will introduce you to the fundamental techniques and skills of home preserving, including selecting fruit, sugar, pectin, acid and the equipment you need to pot up and seal those fruity preserves. We’ll use Huon Valley grown fruit to prepare and make our own jam, and forage for some flavourings growing wild in the garden - think apple mint, rose geranium and lemon thyme. You’ll learn the secret of a delicious, long keeping tomato sauce ‘salsa pronta’, for your pasta and we’ll bottle late summer peaches from a nearby orchard using the Fowlers Vacola method. We’ll also do a special cordial syrup for winter. After all that hard work we’ll enjoy a light lunch in the garden, before finishing off the bottling so you can go home with a few treats for your autumn pantry. The class includes recipes, morning tea, a light lunch and preserves to take home. Both workshops will be limited to an intimate group of eight guests. I'm Delighted to be able to teach another workshop in the state-of-the-art kitchen at vive cooking school, Rosebery. Following on from 'Lunch in sicily', and the second of a series on regional Italian cuisine, this spring workshop will focus on four much-loved roman dishes and finish with a long table dinner. Starting in Trastevere (Rome), and then back home in Sydney: there are so many new workshops at wonderful new venues on the horizon for 2017. 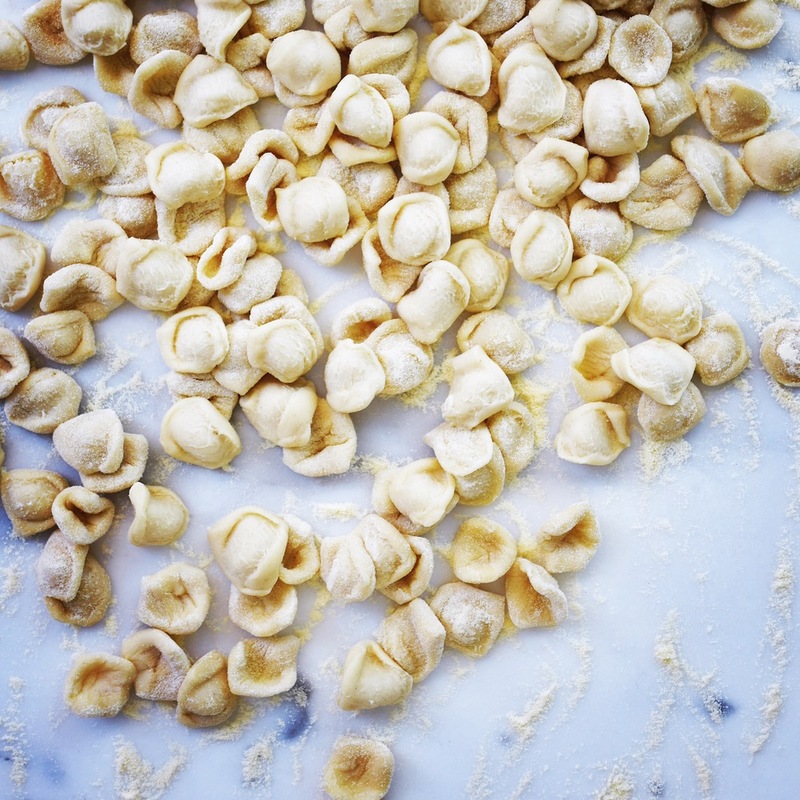 'Asian bites'; Indian lime pickles; 'lunch in Sicily'; Preserving for beginners; a gnocchi masterclass, and more! Just launched... A series of short workshops which will focus on using sustainably caught seafood at Fish & Co. (Harold Park Tramsheds); starting with Wild Prawn + Pork Potstickers. If you'd like to receive my newsletter with more information and booking details; please click the links above, and subscribe to the mailing list at the bottom on the 'blog' page. I would love to cook with you! I would love to help you learn to make these famous little potato dumplings; wonderful, oozing spinach and ricotta gnocchi; and delicious hand-cut pasta with herbs at a workshop in one of my favourite Sydney spaces - the Cornersmith Picklery. We will discuss various flours, how to select the best potatoes, and why using seasonal ingredients is so important to me. All workshops are hands-on, you will be able to take home finished products, and class sizes are kept small so there is plenty of time for questions. NOTE: These workshops have now concluded for 2016. Details for new workshops in 2017 coming soon! My interest first in Italian regional cuisine has led me further afield; now we enjoy wonderful pork and mushroom filled pot stickers, and lovely plump Russian pelmeni at home almost as regularly as a plate of seasonal ravioli. Beginning this winter I will be teaching workshops on how to make all three delicious dumplings: we will hand-make the wrappers, discuss seasonal filling ingredients, and learn the secret to having dinner ready in under ten minutes (it doesn't involve a microwave)! Classes are small and hands-on - and you'll go home with your very own hand-made dumplings. I would love to see you there! I also teach private workshops with menus tailored around your group's needs. These can be for small, intimate groups, or larger groups ( for one person and up to 20) - most will include a long, sit-down lunch. They can be as hands-on as you wish, or more demonstration format. The workshops can be versions of any of the workshops outlined above, or on a wide-range of other dishes and techniques. An example is a 'SPECIAL PASTAS' workshop delving deeper into more of the 300 regional shapes found all over Italy, and the sauces to pair them with. Please contact me directly to discuss venue (which can also be your home), pricing and numbers.